During the 1830s he undertook five journeys west to paint the people who were at the time referred to by the white population as the ‘Plains Indians’. 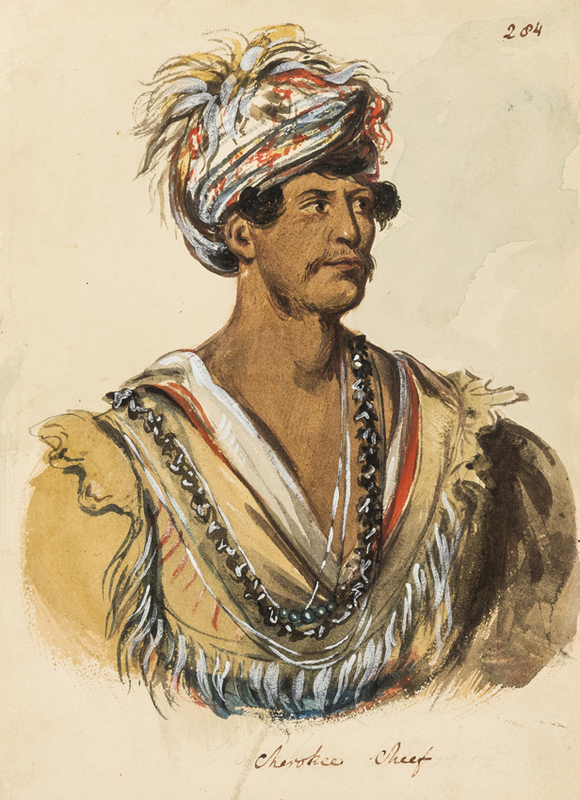 The finished paintings produced following these trips were exhibited in Catlin’s Indian Gallery, where he hoped to reflect the people’s nobility and way of life, as well as to illustrate the devastating impact many of the tribes were experiencing following the Indian Removal Act of 1830. The exhibition started in the US showing in major cities before Catlin took the paintings on a tour of European capitals, including London, in 1840. 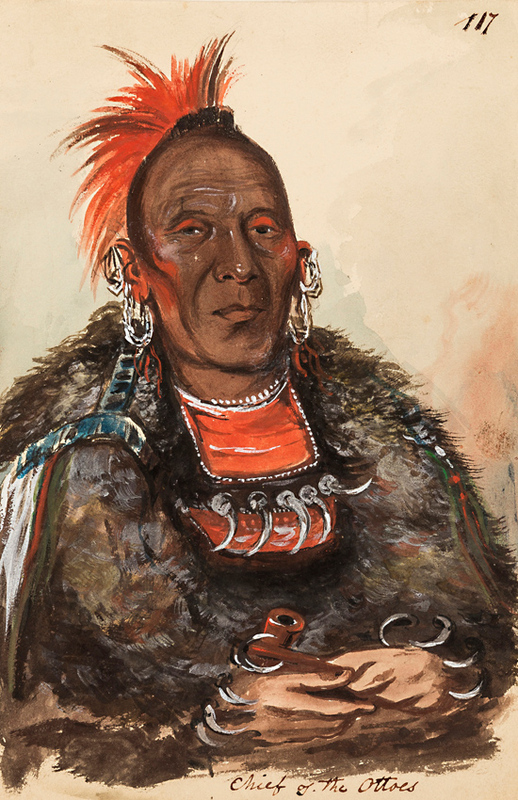 The collection to be offered at Forum’s March 28 fine books, manuscripts and works on paper auction includes seven previously unrecorded watercolours and drawings, of which three are portraits of Plains Indians, and a further six lots of autograph letters. Highlights of the sale include a c.1832 watercolour Wah-ro-néesah, The Surrounder, Chief of the Tribe with an estimate of £3000-5000 and an autograph letter signed to "My Dear Friend" with an estimate of £3000-5000. The “Dear Friend” is thought to be Captain William Henry Shippard - a close friend of the artist and recipient of the letters. According to Forum, these letters and artworks collected by Shippard have never been offered at auction before. Shippard’s personal album of these works passed by descent to the current vendor. An autograph letter signed to "My Dear Friend" with an estimate of £3000-5000 (lot 339). Forum said that works such as these are rarely available on the open market, with the vast majority of Catlin’s artwork now held in museum collections in the US, most notably the Smithsonian American Art Museum's collection. Two original portrait studies of Plains Indians, sitters who were included in the Indian Gallery exhibition, form part of this collection that will be offered at Forum (lot 335 and 336 pictured above). According to Forum, these two portraits, although undated, were likely to have been produced while Catlin was on one of his journeys west in the early 1830s. 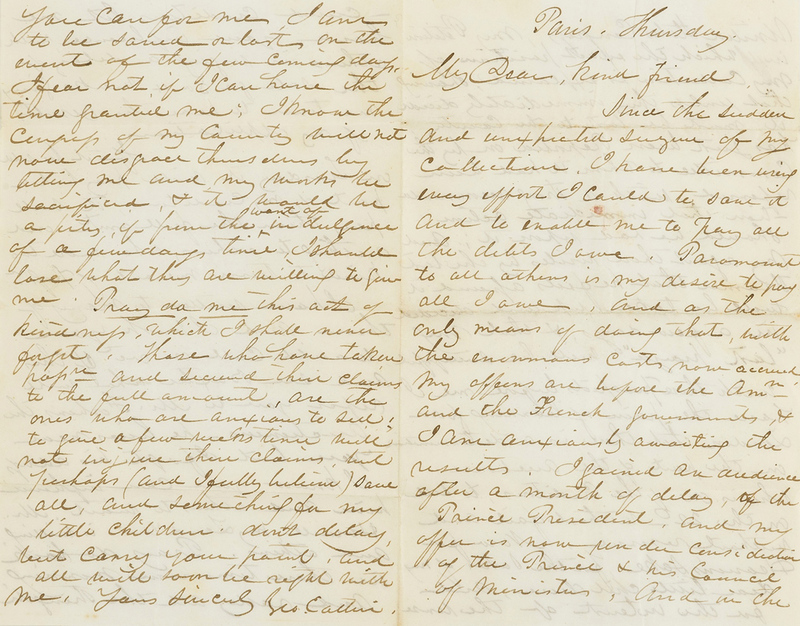 Also included in the sale are letters that illustrate the financial hardships that Catlin was experiencing during, and following, his touring exhibition. Catlin originally wished to keep his life’s work together as a single collection, and it was only after the US government rejected his first approach to persuade them to buy the group en bloc, that he began the European leg of the Indian Gallery tour. Following continued financial difficulties and personal debt, notably detailed in his letters to Shippard (see lot 339), Catlin was eventually forced to sell his collection to the industrialist Joseph Harrison in 1852. Following Harrison’s death in 1879, his widow donated the original Indian Gallery, more than 500 paintings and artefacts, to the Smithsonian American Art Museum. The auction can be viewed online at thesaleroom.com. Were these bird books special copies given to Coenraad Temminck?